Striker Wilfred Bony says he is enjoying life at Swansea City and would be happy to see out the remaining three years of his contract. The Ivorian has scored 24 goals in all competitions since joining the Swans from Vitesse Arnhem for a club-record fee of £12m last summer. Bony, 25, has been the bright spot in a disappointing Premier League season. "I'm happy here. I'm enjoying everything, life here with my colleagues," Bony told BBC Sport Wales. "I'm still here and have three years more on my contract with the club so if something happened the club would have to decide. They have the last word." 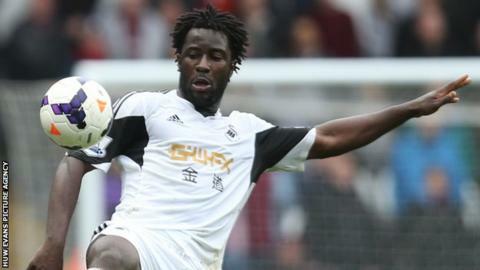 Bony's contribution proved vital as Swansea secured Premier League status for another season. He scored twice in the 2-1 win at Newcastle before a further two goals in the 4-1 win over Aston Villa which finally secured safety. Swansea's Wales defender Ben Davies feels the club may struggle to keep Bony, who is set to feature for the Ivory Coast at this summer's World Cup in Brazil. Bony had previously revealed he questioned why he signed for the Welsh club after struggling to make an impact during the opening months of the season. But the striker said the club's supporters had helped him through what was a difficult time after his move from the Netherlands. "Even when I was not happy in the beginning they kept supporting me and gave me motivation," Bony told Sport Wales. "When I didn't play I sometimes [said] why, what do I have to do to be better? "Everything came into my mind and I tried to find the good way and keep away the bad thoughts." Swansea have two league matches remaining, against Southampton at the Liberty Stadium on Saturday and away to Sunderland on 11 May. Wins in those two matches would see the Swans finish on 45 points - only four short of their best return in the Premier League.